A couple of days ago I wrote about hosting a rather chaotic party “Surviving a Whirlpool”. The next day a wallet was missing which contained a lot of important info. After searching the house from top to bottom, I emailed those in attendance to ask if anyone had seen the wallet during the night and where I thought it had been located. Most responded with beliefs of what could have happened to it based on what they remembered that night. It even escalated into stories about who would have had a motive to steal it and how it could have been done. Each story led me to a new place to look for the wallet so I spent most of the day searching. On the second day I started believing the story that it had been stolen which led to all kinds of mental images of the crime. This morning it was found inside a shoe, nothing missing, just lying there waiting to be found. I guess how it got there really doesn’t matter and still remains a mystery. This incident reminded me that in order to make sense of a mystery the mind forms beliefs, opinions and stories in an effort to understand and before you know it the beliefs become so strong they are perceived as reality. We all had created quite the drama around the missing wallet. So now that we solved the mystery of the wallet, what happens to all the stories and beliefs about it that seemed so real? I guess when you find the Truth, you just have to forget about any stories or beliefs that got you there and let them go…. Every year I host our family Christmas party. We have a large family with over 35 people attending bringing food and presents. I have hosted and attended many gatherings of that size and if planned correctly they can result in some sort of organized chaos. Not this event…no matter how much I plan, it seems to end up being a totally “unorganized” chaos. I don’t know if this comes from one of my control issues or if it’s just the dynamics of this particular group. Since most seem to enjoy themselves I’m assuming it is likely my perception of unorganized chaos. I try to prepare myself for dealing with the chaos and see it as a test of my centering practice. All I have to do is find my center and enjoy the show….but this never happens, not even for a moment. Most of the year I spend time in self realization, self inquiry, meditation and other various spiritual practices…so what good is it if it can all be erased in four hours? It’s as if I have forgotten everything and am totally immersed in a whirlpool of activity that leaves me exhausted and wondering what exactly happened. What to do when caught in a whirlpool? I know nothing of whirlpools but after a little investigation it seems they are unavoidable if you’re following the flow of the river. The best you can do is to just deal with it for a while and then it releases you back into the flow. Doesn’t do much good to plan for it…. I usually don’t have a particular intention during meditation but today I had the intention to understand my next step in this spiritual journey. I feel like I’m jumping around again between different teachers seeing the sameness in all their teachings. I put out this intention…didn’t get an answer so I quit meditating early with a bit of an attitude. The attitude was one of feeling discouraged wondering if I will ever be content to just “be”. I sporadically keep a journal. I picked it up and read about a dream I had almost exactly a year ago to the day. I was trying to find a connection at a train station. I was running around trying to find the next train, up and down stairs, in elevators and then a man appears in a chair with wheels and says he knows the way and to hop in. It was uncomfortable fitting in the chair with him at first but I got settled in and we flew through the station quickly. I remember the relieve of giving up looking on my own and letting him navigate. I don’t remember if we made it because the next thing I remember is looking at him from a distance and he was eating chocolates not worrying about catching the train at all. Then I started judging whether he was the right one to lead me after all and the anxiety started again. Well, here I am a year later still looking for the next train. But now I finally realize why I never want to stop seeking or looking for the next train. If I stop seeking I’m afraid of going back to sleep again and living my little mechanical life outside of awareness. My spiritual life has always been a priority for me and I try to keep it strong because my little life has never seemed as important to me as my spiritual life. It came to me that I need to switch that notion and make my little life a priority because that is what is..right now. It’s not attached to the next teacher or to the cushion. This is one of the common threads in most teachings but now I may be actually getting it. I’ll have to remind myself (probably often) that the fear of going backward and living that mechanical life outside of awareness is not possible because my hope is that once it’s seen… it cannot be unseen. My next step is to realize that my little life is what is important….living it within awareness is the practice. I guess maybe having an intention during meditation is a good thing after all. I walked a large outside labyrinth this weekend. I had never walked an outside labyrinth nor one this large. I was the only one walking so I walked a moderate pace and it took 45 minutes. It was in an open field with a narrow uneven mowed down path in grass and wildflowers that were knee-high. At the beginning I was thinking of the history of the labyrinth dating back to 4500 BC showing up in every culture around the world and the mystery of it all. Then I started thinking about the correct “procedure” of walking the labyrinth, was I walking too fast, too slow, this is walking meditation, I need to stop thinking so much, how much longer until I reach the center? All the same things that happen during regular meditation. After about ten minutes this mental activity slowed down and I began to notice how many crickets there were on the path, and butterflies and all the different kinds of flowers. Then I became interested in my destination and started looking ahead trying to see the center but I couldn’t tell where it was because of the tall grass. I could only see about four feet in front of me…I couldn’t look ahead.. all I could do was follow the path because I knew it would lead to the center eventually. When I got to the center I thought maybe there would be something there to symbolize the end of the journey, even just a candle or something….there was nothing. I stood there for a moment but didn’t have the desire to stay for any long length of time contemplating so I headed out on the same path out of the center. I noticed that the walk out of the center was a little faster pace and easier for some reason. I hadn’t noticed earlier that the walk into the center seemed harder and longer but now noticed that walking in the uneven terrain was much easier. I stopped and looked back at the center a couple of times but again I couldn’t see it when I looked back. Then all of a sudden the path opened up and I was done. That was definitely meditation in motion….. The most common spiritual inquiry question “Who Am I?” has been a question of mine since I can remember. Not because of spiritual inquiry but because of wondering what my name really should be. I was named after my father whose name was Harry Carl so the closest female version of that name was …Harriett Carlyn. The label was strictly a namesake because no one ever called me by either name. At some point the “o” was put in the middle name making it the more commonly known name of Carolyn. After that, my label changed many times throughout my life. I just counted seven different forms of identity in my wallet all with different names. This display of aliases has created problems for me at times especially in airports. Maybe that’s what started my spiritual quest of trying to discover who I really am. I always envied people who were given a name at birth and have never known any other label. It seemed they always knew who they were and I was always wondering. So now that I’m on this road to “no-self” I can finally stop wondering who I am…and just be whatever name pops out of my wallet that day. It’s been a long time since I have posted anything here. I know that I’m supposed to be a retired seeker but I fell off the wagon and have been obsessed with reading, listening to videos, seeking for something that is almost within my grasp. These spiritual binges usually start when I come across a spiritual teacher who resonates with me at this particular time and seems to be transmitting exactly what I need to hear. I keep reading and listening because the missing piece that I need to keep this spiritual light glowing might just be in the next book or video. Most seekers know the old “I’ve had it – but can’t keep it” feeling so the goal is to find the missing piece of the puzzle that tells you how to keep it so there will be an end to seeking and living in a state of bliss will be your norm. That’s just it, seeking with a goal in mind….seeking with an urgency that something else is about to dawn and everything will be cleared up once and for all. So after almost two months, I realize that the addicted seeker is still alive and active. The addicted seeker is always seeking a different experience than what is happening right now. Don’t get me wrong….I love seeking for Truth and love the way it makes me feel and experience life but now I can see the difference between an addicted seeker and a lover of Truth with more clarity. The addicted seeker is driven by the desire to re-experience the pleasure achieved through a spiritual experience similar to any addict wanting to have another pleasurable experience. A lover of Truth is not driven to find some missing link that will keep the enlightened state active. A lover of Truth is not looking for anything…only experiencing. I started this blog when I began the process of retiring from the search and I have to admit that over the last year there has still been more seeking than non-seeking going on. Nonduality has been my focus and naturally coming out of that is a different kind of seeking, the seeking of direct experience or direct inquiry. I still hold the assumption that there is someone in here experiencing things and people out there. I have accomplished being the witness of thoughts and things (most of the time) but now what is behind the witness has been my question. Direct experience may be what will eventually replace the witness but letting the witness go is difficult and requires a shift in perception. This shift in perception reminds me of illusionary art called stereograms where a 3D image is hidden within a drawing and you can only see the hidden image if you learn to re-focus your gaze. When you finally see it, it magically appears out of nothing. Most instructions tell you not to focus on the picture but fix your gaze beyond it. 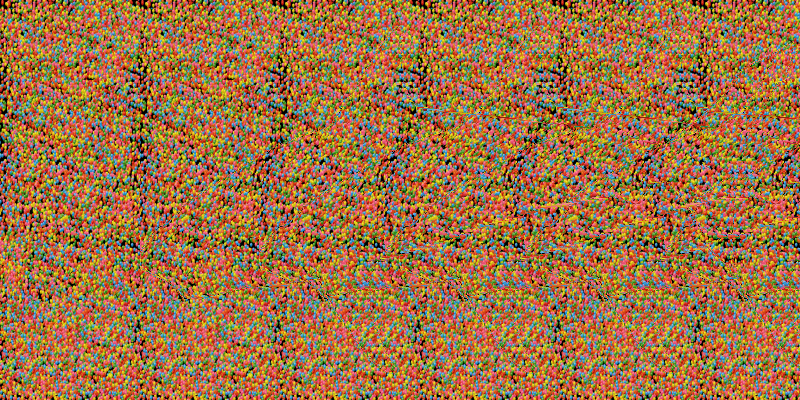 I was never good at finding the hidden images. I recently reintroduced myself to the teachings of Francis Lucille which led me to again consider the Direct Path experiments by Greg Goode. Maybe the timing is right to get down to some serious direct experience investigation so a few days ago I started the experiments which seem to be similar to learning to look through the illusion and see the hidden images. The first experiment in the Direct Path involves the perception of hearing because it’s supposed to be the easiest. During the experiment of ringing a bell, at first the sound still seems to be coming from the object of the bell and I can’t get past that. Looking closer…since I am to use only the sense of hearing I just hear the sound without the interpreter telling me that the sound is coming from a bell. Maybe that’s it…my direct experience is that hearing is just happening with or without the use of an interpreter. One experiment down and 39 more to go….This could be intense but I’ll keep you posted. If there is anyone else out there who has already been on this part of journey and the hidden image in the picture has appeared, please let me know. There’s supposed to be a shark hidden in here somewhere…I can’t see it yet.